Pat Sullivan was saluted Oct. 7 at the halftime of John Carroll’s 40-7 win over Springville, as the Cavaliers’ home field was named in his honor. From now on, the Cavs will play at Pat Sullivan Field. Journal photo by Marvin Gentry. Current events in our nation and around the world make some people wonder if there are any heroes remaining. Maybe they don’t know where to look. The alumni rolls of John Carroll Catholic might be a good place to start. One of its heroes is Pat Sullivan, class of 1968. Sullivan was saluted Oct. 7 at the halftime of John Carroll’s 40-7 win over Springville, as the Cavaliers’ home field was named in his honor. From now on, the Cavs will play at Pat Sullivan Field. As any young football fan in Alabama knows, Sullivan starred at John Carroll before undertaking a legendary career as a quarterback at Auburn University, which climaxed with him being awarded the Heisman Trophy as the nation’s top college football player in 1971. He later went on to play for the Atlanta Falcons and Washington Redskins. After retirement from the NFL, Sullivan worked as an assistant coach at Auburn and at UAB and served as head coach at TCU and Samford University. Although John Carroll moved off its original Southside campus nearly 30 years ago, Sullivan felt like he was home again when he returned to his high school alma mater. If his big night at John Carroll triggered fond memories for Sullivan, the mere utterance of his name brings back great memories to a generation of college football fans in Alabama. Sullivan was arguably one of the most exciting players in Southeastern Conference history, setting an NCAA record for touchdown responsibility that stood for years. But more than setting any records or even for winning the Heisman Trophy, Sullivan was most admired for the classy way he represented Auburn and the state during his playing days and beyond. For all his success at Auburn and his time in the NFL, Sullivan said the years he spent as a Cavalier were among the greatest of all. Although John Carroll had only about 23 players on its roster in those days, the team enjoyed widespread support from the student body and community. 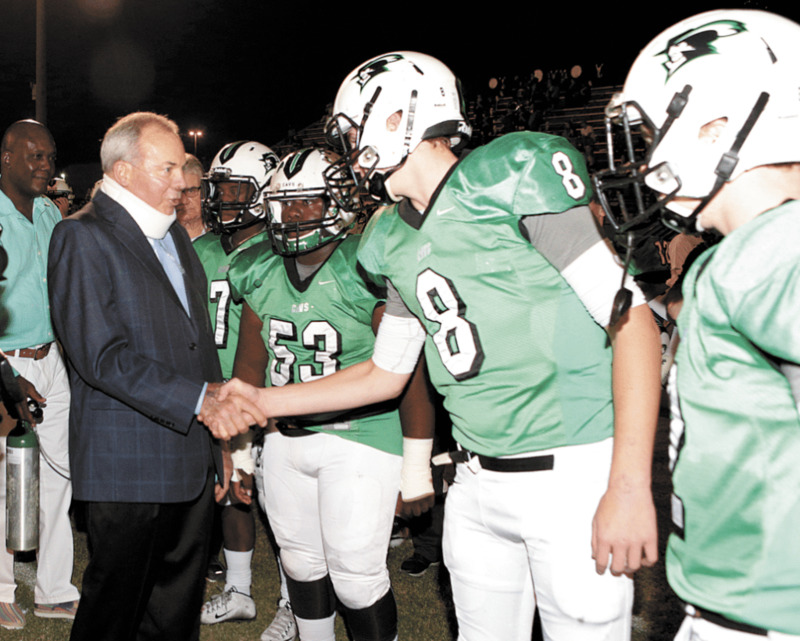 Sullivan’s fondest memory of high school football was simple – just playing the game. As one of the nation’s top high school quarterbacks, Sullivan was heavily recruited by colleges across the nation. Recruiting was much lower key than it is today. There were no rating services or recruiting “experts,” and the NCAA had far fewer rules governing the process. When Sullivan was treated to dinner by the coaches, he usually ordered the same thing: steak. While young Pat Sullivan got his steaks, everyone else got so much more: a leader, a winner on the field and off, a role model and a community icon. Sullivan may have played at John Carroll and Auburn, but he belongs to us all.